The obstacle isn’t necessarily in your path; perhaps it is your path. I took a New Year’s yoga class in which the teacher used this theme. We can’t always remove our obstacles. Sometimes we learn to work with them and learn from them. During my run a few days back, I heard coyotes singing. Then they started yipping and growling, as if there was some kind of scuffle going on. They weren’t far ahead of me, and I remembered that a friend had once been followed by a pack of coyotes when she was hiking alone. Though coyotes almost never attack humans, running past this pack, whatever they were doing, seemed like a bad idea. 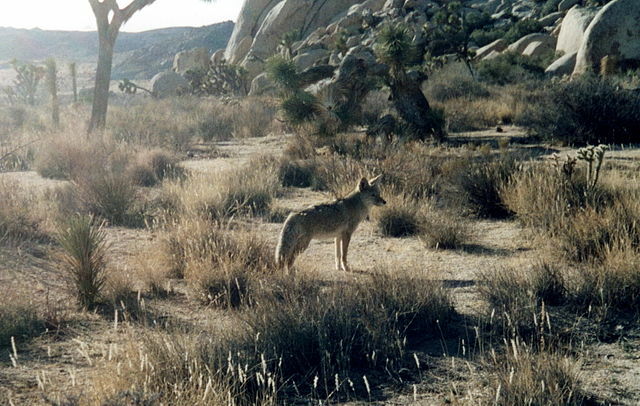 Maybe there were just two—it’s coyote mating season—but maybe it was a fight with an outsider to their territory. The noise stopped, and through the gaps between shrubs, I spied them trotting silently toward the section of the trail I was headed for. When in the presence of predators, I told myself, don’t act like prey. I turned around. Danger is exciting on the page, but even the smallest danger doesn’t appeal to me in real life. Reversals, however, are interesting in both cases. I saw the landscape from a different perspective, since I usually go up the long hill rather than down. The same place can look quite new from the other side. And I ran further, since I had to retrace my steps. That evening, my work in progress was so stuck it was putting me to sleep. Not a good sign. I wasn’t sure how to fix it, but I told myself I was going to push through and not go out dancing that night, though there was a musician I would have enjoyed hearing at the Brewery, and I can walk there in five minutes or less. Still stuck, I gave in and went. My favorite dancing partner was there, and an acquaintance who is a mystery fan. I danced a few songs with one, talked story structure with the other, and then headed home, ready to write. The problem lay in being too linear, telling the story step by step. I need reversals, a surprise, and something as energizing for the reader as a wild dance with a strong partner.